She placed him in a manger, because there was no room for them in the inn. ADVENT begins on the 2nd December and is often referred to as ‘a time of preparation’. All of us know how easily we can get caught up in our Christmas preparations and so miss out on the opportunity which God gives to us in these few weeks of the Season of Advent. The word ‘advent’ comes from a word meaning ‘coming’ and one of the themes of Advent is the looking forward to the time when Jesus Christ will come again, in all his power and glory, as our Lord and Judge: his ‘second coming’. The more popular theme for the Advent season is as a time of preparation for the celebration of Jesus’ coming into our world as a human child: ‘Emmanuel – God with us’. It would be good if, in the middle of all the other things which have to be done, we could make some time really to focus on this great truth. We believe that God, in the person of Jesus Christ, really has come into the world: born into a poor and very ordinary family, growing up sharing in all the experiences of human life just as we do. But then going on to do something truly amazing in giving his life on the cross for us, dying and rising again that we might share in his risen life. How might we focus our preparations? One suggestion is to use the familiar figures who appear in the nativity story. Perhaps to stop for a moment and try to imagine yourself as one of those shepherds, for example, experiencing the awesome beauty of the hosts of angels proclaiming the good news. Hurrying to Bethlehem, to the stable or outbuilding and finding the tired but elated parents with their newborn child, all wrapped up against the cold of the night. Knowing somehow, sensing deep within your soul that this child is more special than any child that has ever been born and ever will be. Falling to your knees, overcome by the urgent need to bow down and worship, to worship the newborn King. And there are the other familiar nativity figures; you could try this imaginative way of praying with one of them! However you prepare yourself during this Advent season, when Christmas really arrives, join the shepherds, the wise men, Mary and Joseph, the whole host of heaven, and one another, to worship the Saviour of the world. ‘Emmanuel’: ‘God with us’. I am very pleased to be able to announce that a new curate will join us next year to replace Fr Grant. David Gardiner is currently in his final year at Westcott House Theological College in Cambridge and will be ordained as a Deacon in Gloucester Cathedral on Sunday 29th June 2008. David will then begin his training with us as a full-time stipendiary curate in the North Cheltenham Team Ministry. David is in his 20s and recently married Sarah. They will live in Boulton Road. Progress on this appointment has not been so good. A second round of advertising produced only one applicant, who has not been invited for an interview. I have had some discussion with the Archdeacon of Cheltenham about the way forward and the PCCs in Prestbury and All Saints’ will also need to discuss this. We have to ask ourselves why people are not responding to our advertisement, especially when we are told that we are offering a very good post in a highly desirable area! Some difficult questions will need to be addressed before we advertise again. In the meantime I am very grateful for your support and understanding for me as the only full-time priest in our Team Ministry. I would also like to pay tribute again to all the clergy who support us and to all those members who take such active roles in ministry. On Sunday 20th January we welcome Diane Bruckland, who is joining our Team Ministry on an eight-week placement. Diane is in the second year of her training for Reader Ministry and will be with us until Easter Sunday. 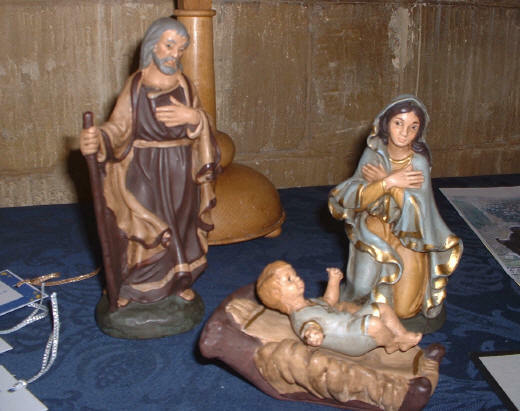 We have become increasingly concerned over recent years about the health and safety implications of the very large number of people who attend the Crib Service in St Mary’s on Christmas Eve. It is wonderful to have so many of all ages (over 400 last year) but the building is simply not large enough to accommodate so many people safely. This year we are trying something new! There will be two Crib Services in St Mary’s on Christmas Eve: at 4pm and at 6pm. They will be identical, but admission will be by free ticket. Tickets will need to be obtained in advance and will be available from various sources around the village. Details of where to collect tickets are listed elsewhere in this magazine. Please make a note of these arrangements and do your best to let people know. We hope that the numbers attending both services will be reasonably balanced and more safely manageable. There will also be a Candlelit Nativity Service in St Nicolas’ at 6pm on Christmas Eve. It is December again, Advent again, and here in Prestbury and All Saints Fr Michael has been our Priest-in-Charge for a whole year. A lot has happened and many things have changed, though not always how and when we expected. We have learned a lot, though. The power cut during Fr Michael’s licensing service taught us not to take electricity for granted. More recently we all had to cope with no running water in our houses. We are also learning to do without the luxury of three full-time priests, which is actually giving the rest of us the opportunity to explore our own potential for ministry. Just as in July we found ourselves talking with neighbours, and even strangers, at the bowsers, so we are discovering how we can minister to each other at services where there is often no priest – Celebrate!, Compline, Morning and Evening Prayer – and how then to extend that ministry out into our everyday lives. After Jesus had performed the servant’s task of washing his disciples’ feet he told them to ‘wash one another’s feet’ (John 13:14), which is sometimes so hard to contemplate doing. The North Cheltenham Team Ministry hasn’t happened yet, but the North Cheltenham Mission Area is up and running, and we have the opportunity to visit the other churches for social events as well as for services. We can start putting faces to names. Just to say a big Thank You to Marion and Fr Michael for all their hard work and organisation. This was my first visit with St Mary’s to Sidmouth. The hotel and food was excellent especially as I am a vegetarian. We had lovely weather and the weekend was very relaxing and enjoyable, and I am looking forward to the next trip. Prestbury Hall, Bouncers Lane, was originally built in the late 1950s as the Church Hall for St Mary’s. In 2005 it was leased by the Parochial Church Council (PCC) to a committee of Trustees for management. The Trustees drew up a programme for refurbishment and improvement and have been able to attract considerable funding principally as grants from Gloucestershire Environmental Trust and Cheltenham Borough Council. The hall is now a warm and welcoming environment for meetings, parties, receptions, concerts or dances and the Trustees hope that it will be put to good use as a worthy hall for all the community. Bookings can be made by email to prestbury.hall prestbury.net. or by telephoning 239590. MONTHS of work creating staging, dyeing T-shirts and hunting out ‘ethical’ fashion came to a climax with the eagerly awaited Fashion Show. The atmosphere was one of excitement on the day. Much of the hard work of sorting out staging had already been done by Pittville Youth Action Group – but there were still lights, PA, and visuals to set up as well as routines to finalise. The moments we snatched to pray together that God would be at work through it all were invaluable! A packed St Nicolas’ saw Anna and Tom introducing the event with energy, insight and humour. Their role was pivotal in making the evening go so well. 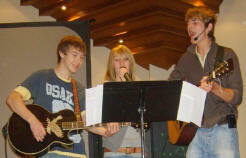 The worship group cranked it up with renditions of some of the favourite Synergy worship tunes. The mood went reflective as we all took on board the working conditions of many within the garment trade. The evening was not about feeling guilty though, but about a practical response. Squatt::Orange were one example of an outlet for fairly traded (and stylish) T-shirts – displayed by individuals and the youth work team. There was a humorous look at fair trade and sport with our own Gary Lineker and Simon the keepy-up king. It was fantastic to have Mary and Esther from Tearcraft with exquisite jewellery, scarves and bags – all fairly traded. It was very powerful to hear the stories of the individuals who had made the items! We then turned to the makers in our own groups as homemade dresses, ‘recycled’ T-shirts and tie-dyed shirts were paraded. The emphasis was on ‘reducing, reusing and recycling’ – there was a guest appearance by Fr Michael to acknowledge his contribution to ‘lived-in fashion’ by consistently wearing black! 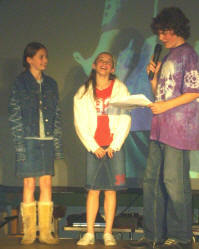 There was even a chance for Chloe and Ben to take to the stage in the ‘mini-me’ category. This section ended with the capturing on video of the ‘charity shop challenge’ by Charis and Sophie. They clearly had great fun and managed to find real bargains! 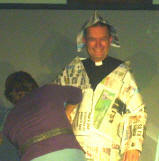 The evening drew to an end with the hilarious ‘newspaper fashion challenge’ with two teams from the audience producing masterpieces from newspaper – Fr Michael was attired very ‘creatively’! As the laughter died down the worship group led songs reflecting the foundations of faith – the unfailing love of God for all – especially the poor. Reflecting afterwards, it had been an evening of nervousness and excitement, but most of all an evening which highlighted the diversity of PPY’s youth work and of the gifts and talents we all have to bring. The young people were fantastic, but don’t forget the youth work team (and guests) whose unassuming support made it all possible. Perhaps it was one of those rare moments when God brings it all together and you can say ‘this is what it is all about – life in all its fullness’. Thank you to everyone who helped make it such a great night. HOW OFTEN have we all heard conversations beginning with ‘Young People Today… they are rude, rebellious, troublesome, lazy etc’? Not True!! The Prestbury & Pittville Youth Alternative Fashion Show produced a large number of young people who were enthusiastic, committed, respectful and certainly far more environmentally aware than my generation ever was. We saw their efforts in showing how we are not clothing the poor as instructed in the Bible, but are allowing the poor to clothe us. This is often work done in dire conditions, for very little pay and extremely long hours, so that we can wear that designer labelled outfit. All too often child labour is used to produce products to make our children look good. Our young people certainly drove home the message about being careful about what we buy: re-using what we have; recycling our clothes; and shopping at charity shops rather than at High Street stores for our clothes. Well done to all our young people, who have such a lot to teach us ‘older folk’ – they can often see what we can’t and we should give them a voice and listen to it, rather than criticising them, as all too often is the case. This was held in St Nicolas’ on 10th November and was a marvellous event; if you missed it then you missed a real treat! I would like to thank all those who put so much hard work into making the evening so successful. Young people from all of our different youth groups and from all three of our churches took part, all making their own contributions to such a varied, enjoyable and also thought-provoking evening. Very special thanks must go to Andy, Sharon and all the youth leaders for their tremendous effort. Well done! In anticipation of the new North Cheltenham Team Ministry the webmasters have decided it would be appropriate to have one website for the enlarged Team. This is our way of welcoming the other parishes and demonstrating everyone is included. There will need to be a new start on the website, a complete makeover from what we have at present. What three things do you like most about the present parish website? web allsaintschelt.net and web prestbury.net. To help alleviate the ventilation problem at St Nicolas’ the triangular window above the entrance to the church is to be replaced. The new window will have the two centre sections as opening windows. This will not solve the ventilation problem but, as agreed with the architect, it is phase one of a possible solution. On the evening of 26th October we held a Bridge Drive and Supper in St Mary’s to raise funds for the Fabric Appeal. It is not easy for an organiser to judge what the participants thought of the event, but they seemed to enjoy it. In particular there were complimentary remarks both about using the church itself for a social function and about how attractive the nave looked with all the tables set out for a meal. Thirty-six people played bridge. Of these, eighteen came from the parish (and were a mixture of regular church-goers and those who were just interested in supporting the church) and eighteen came from Cheltenham and outlying villages. So often the burden of fundraising falls on those who already give much to the church. So it was nice that we were able to attract ‘outsiders’ to support the cause. In total the evening contributed £500 to the Fabric Appeal. May the kings of Tarshish and of the isles render him tribute, may the kings of Sheba and Seba bring gifts. May all kings fall down before him, all nations give him service. These words are taken from a Psalm of Solomon, the wise Old Testament king, to whom the rulers of the nations flocked to benefit from his wisdom. At Epiphany however, the Church uses this Psalm to point us to the Magi, those wise men bearing gifts who came to worship the Christ child. Their arrival in little Bethlehem must have caused quite a stir amongst the neighbours, wondering who on earth they were and why they should have travelled such a long way, just to see a baby. But I suspect there would have been an even greater stir had they understood the ultimate significance of that visit. When Christianity started to spread out beyond Jerusalem in the first days of the Early Church, there was quite a lot of tension between Jewish Christians loyal to the old teachings and practices of Judaism and new converts to Christianity, who had not been brought up as Jews. St Luke tells us in his Acts of the Apostles that it took quite some time for the two schools of thought to come to a common agreement. It must have been difficult for those first Jewish Christians to accept that God could care as much for other people as for them; not easy to accept that He would not be offended if they chose to eat pork or share to a meal with a non-believer. I guess that for some of us our journey of faith may have been something like that. Perhaps the ideas and preconceptions developed in our early years as Christians were challenged as our understanding matured. Maybe we were obliged to change the way we had always done things – moving to a new area and worshipping at a different church, where things were not the same as we had been used to, a different order of Service or unfamiliar hymns. At first, this sort of experience can be very unsettling. It might even lead to a sense of bereavement at the loss of something precious, but with hindsight we may begin to realise that these new experiences have actually enriched rather than diminished the way in which we are able to express our belief. In the Prestbury and All Saints’ Team we are lucky to have three quite different churches, each contributing its own special insights to our shared faith. In addition we already have Ecumenical links with other churches in Prestbury and our fellowship is now further extended to include the parishes of Swindon Village and Elmstone Hardwicke. Perhaps it is more than a coincidence that the Week of Prayer for Christian Unity always falls within the season of Epiphany, a time for us to remember the Magi who came from afar and to join in worship with Christians the world over; celebrating God’s love shown for us in Christ Jesus, and inviting people everywhere to share in the salvation that He was born to bring. Linda Biggs at St Nicolas’. On Saturday 8th December 2-5pm we will again be celebrating the ‘Real Christmas’. Our Christmas tree will be up and decorated. The Christingle oranges will be assembled during the afternoon, there will be some Christmas activities for the younger visitors, seasonal refreshments for everybody, a small number of charity stalls will be selling Christmas Goodies, and there will be live festive music during the afternoon, including carols sung by our Choir. Father Michael will send us all off with some thoughts on the real meaning behind the celebrations. All our village churches are going to be represented once more. We hope you will all join us at St Nicolas’! This year we shall be holding the Christingle Service in aid of the Church of England Children’s Society in St Mary’s Church, Prestbury, on Sunday 9th December at 4.00pm. Christingle is a simple, moving service with great appeal to children, young people and their families. Christingle oranges are presented to everyone who brings a gift of money for the work of the Society. We hope that you will be able to come and help raise money to brighten the lives of children for whom Christmas would otherwise be a rather bleak time. We hope to see you there! The last Bible study session this term will be on Tuesday 11th December when we shall look at the angel’s annunciation to Joseph in Matthew chapter 2. We meet in All Saints’ church at 6.45pm for a 7pm start, and we hope you will be able to stay afterwards for the short service of Compline at 8pm. In the New Year we return to our studies of Matthew’s gospel, picking up again at chapter 16, on Tuesday 8th January. Copies of the study guide (price approx £4) are available from Jen Swinbank. Do join us even if you can’t come every time. On Saturday 15th December we shall be singing carols for Christian Aid: St Nicolas’ will be at Sainsbury’s in Priors Road from 10-11am and St Mary’s at Sainsbury’s in Tewkesbury Road from 11am-12noon. Please join us if you can. There will be another opportunity on Thursday 20th December when the Salvation Army invite us to join them in singing in the Beechwood Arcade from 7 8pm. Thank you to those who helped or supported at the Christmas Fair on 3rd November at Holy Apostles’ Church Hall, which raised the excellent total of £1,114. Our next meeting is a Christmas Social with Readings on Tuesday 18th December at 7.30pm hosted by Sheila and Cyril Beer. Anyone welcome to join us even if not a member of the MU. Please bring a small plate of food to share. On Tuesday 22nd January John Mead will give a talk entitled William Hogarth – a Truly English Painter. We shall meet at St Nicolas’ at 7.30pm. All are welcome. Early notice for the new 2008 diaries! The Epiphany Supper will be taking place in St Mary’s church as in recent years to complete the Twelve Days of Christmas. There will be the usual Supper and Desserts, followed by entertainment. Tickets and further details will be published in the pewsheets nearer the time. It really was a sell-out last year, so please plan early if you intend to be there. An Epiphany Presentation by Fr Tim Raphael on Sunday 6th January in St Nicolas’ Church at 4.30pm, followed by tea and cakes. The afternoon concludes with a service of Epiphany Carols at 6pm. Do join us for this Team-wide event. There will be NO bakestall in December, as is now our custom. The next one will be next year on Sunday 20th January, when members of all three teams are invited to contribute so that we make a good start with our giving in 2008. Thank you to everyone who brought and bought in 2007, enabling us to send donations exceeding £400 in total to the Charities we support. Do read the details on the list on the notice board in the porch and feel free to make suggestions for future giving. With the proceeds of the three concerts to date, together with other gifts and donations, we have over £2000 towards the repairs to the Walker Organ in St Mary’s Church. There are three more concerts planned for the New Year. Grateful thanks to everyone who has contributed to the fund. Do you have pre-school children and would like to meet new friends? Then come along to Rockers on Thursday afternoons at St Mary’s Church from 2-2.45pm (term time only). Rockers offers children a relaxed atmosphere to introduce them to the Church, by singing action songs, listening to a short bible story, encouraging them to take part in a creative activity or play with toys. There is also an opportunity for the adults to enjoy a cup of tea and a chat. Fun and friendly, please come along. Our last meeting this term is 13th December and we start back in the New Year on Thursday 10th January. For information please contact Vicky Dunn on rockers prestbury.net. Next year’s Lent Course will be taking place in House Groups looking at the Chronicles of Narnia with a Study Guide by Hilary Brand, writer of the popular Christ and the Chocolaterie. Lent begins early, on Wednesday 6th February, so we need to begin identifying venues NOW. Able to provide a venue where a group might meet? Willing to lead a group, either in your own home or at somebody else’s house? Able to lend out a copy of the video or DVD, for the use of a House Group?